I was Chinese ambassador to the UK for more than five years. Though it has been 10 years since I left Britain, I have been following closely the developments in UK and in China-UK relations. In my observation compared with 10 years ago, China-UK economic cooperation has not only grown in size but also expanded to more areas. This has generated broader benefits in both countries. Take two way investment as an example. When I was in Britain, Chinese investment in the UK was modest. The number of Chinese enterprises in Britain never passed 100. While the statistics of British Chamber of Commerce in 2010 showed that in recent years around four to five hundred Chinese enterprises had established presence in Britain. Such collaboration has made both sides winners. In 2011, the MG Motors plant in Longbridge, Birmingham invested by China’s Shanghai Automotive Industry Corporation resumed operation and unveiled two new cars. It had been 16 years since a new MG model rolled off the Longbridge lines. It revived a famous British brand and created more than 400 British jobs. Another compelling example is China’s Huawei. In 2004 Huawei moved its European headquarters to Britain. Over the years it has grown into a globally competitive brand. Not long ago Huawei announced its plan to invest another 1.3 billion pounds in the UK. This will create at least 700 local jobs in the coming five years. More and more Chinese companies have settled in Britain. They have not only made breakthroughs in their own business but also contributed to the growth of British economy. Britain led other European countries for many years in terms of investing in China. These investments yielded generous returns. For example Late last year both Jaguar and Rover reached agreements on joint venture with China’s Chery Automobile. Together they will invest more than 1 billion pounds to make British cars in China. Britain’s favourite coffee shop, Costa, plans to triple the number of their shops in China to 500 by 2016. Costa believe that with enhanced spending ability, the annual intake of coffee of Chinese people per head will grow rapidly. Costa estimates annual consumption will rise in China from the current 3 cups to something close to the world average of 240 cups. Marked progress has been made in China-UK economic cooperation. Yet given the sizes and strengths of our two economies, great potential remains untapped. This holds out great opportunities for us to step up our cooperation. I have recently read an article by Stephen King Wake up. Our trade with China is pathetic. This article was published in The Times newspaper. According to this article, a pathetic 0.4 percent of Britain’s national output heads to China. The figures of Germany and Korea are respectively 2% and 12%. It might be easier to figure out what these figures mean if we make another comparison. China has 1.3 billion people, while the population of Ireland is only more than 4 million. Yet Britain’s exports to China is only half of its exports to Ireland. A Swiss friend of mine once joked: so long as every Chinese consumes one bar of Swiss chocolate every year, then chocolate export target of Switzerland will be easily reached. I believe in some areas this case also applies to Britain. Global economy at present is still in the doldrums. IMF statistics show that world economic growth rate in 2012 was merely 3.3%. Developed economies grew by 1.3%, while euro zone economies -0.4%. Emerging economies also slowed down. Growth rate of the Chinese economy last year dropped to 7.8%. The troublesome economic situation requires closer cooperation of all countries for a collective response. China has not been immune from the international financial crisis. But prospects for the Chinese economy remain bright. China’s development will surely also boost growth of its cooperation partners. Urbanization rate in China has just passed 50%. The increase of every percentage point means about 13 million people will be better off. For Britain, this means a lot more Chinese shoppers on Oxford and Bond streets. Some estimate that China’s urbanization will generate 6.4 trillion US dollars of investment demand by 2016. Even modest forecasts say that in the coming five years China’s outbound investments will top 100 billion US dollars and its imports will total more than 10 trillion US dollars. Britain has placed much emphasis on some infrastructure projects, such as high speed railway, telecommunications and nuclear power. These will take hundreds of billions of pounds. I am sure Chinese capital will make these projects easier. London also intends to become one of the off-shore centers of RMB business. This of course needs close collaboration of China and Britain. It takes two to tango. Failing sincerity and hard efforts from both side, stronger China-UK cooperation would be impossible. It entails efforts from not only businesses, but also governments. Media reports show business leaders of our two countries are not idling. Apart from the efforts of business community, governments should also play a positive role. For example, they should resist protectionist pressures, maintain openness in trade and investment and create an enabling environment for business cooperation. Facts show that government endorsement and support from top leadership will boost economic cooperation and lead to big contracts. In 2011 when Premier Wen Jiabao visited the UK, the two sides signed contracts worth more than 4 billion US dollars. To translate the potential of China-UK cooperating into reality needs greater mutual trust between the two countries in political, economic and other areas. It also requires targeted efforts of the two governments to foster a sound environment for cooperation. With a predictable environment, business community will be sure about the returns of their investments and the general public will be confident about the benefits and bright future of China-UK relations. 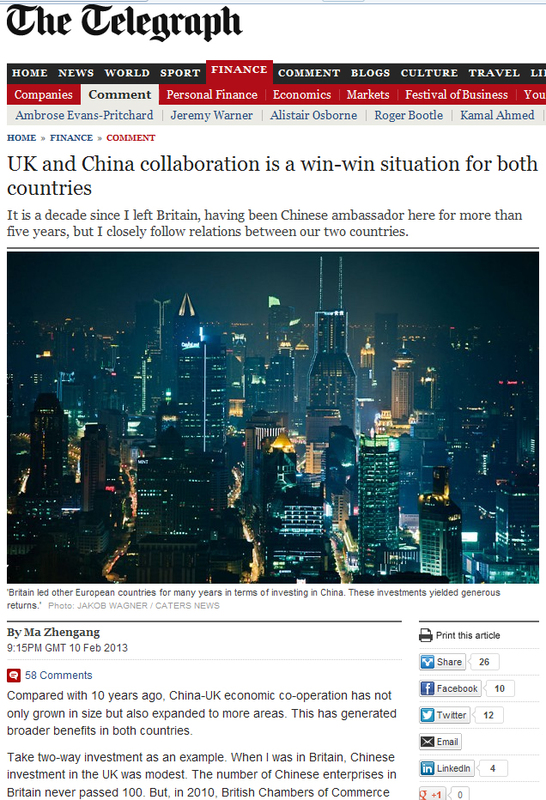 China-UK cooperation faces both opportunities and challenges. The two sides need to work together, seize the opportunities and address the challenges. In this way we will have more successful examples of win-win. To borrow an expression now popular in China, we want more ‘positive energy’ from China-UK cooperation.